Be the first to share your favorite memory, photo or story of Gary . This memorial page is dedicated for family, friends and future generations to celebrate the life of their loved one. 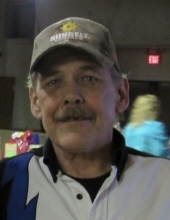 Gary L. White, 61, of Milan, passed away Sept. 23, 2017, at his home. A celebration of life will be 1 p.m. Saturday at Friends Circle Club in Moline. Burial will be in Rose Lawn Cemetery at a later date. Quad Cities Cremation Center is assisting the family with arrangements. Memorials may be made to the family. Gary was born Feb. 9, 1956, in Moline, the son of Earl and Shirley Dopler White. He worked as a concrete finisher and enjoyed spending time with his daughter. Survivors include his daughter, Cheyenne; niece, Ashley White; nephews, Jason and Marcus White and Owen Hansen; and special friends, Kathy and Randy Gill, Dave Estes and Dan Barth. Gary was preceded in death by his parents and brothers Steven and Mark. To plant a tree in memory of Gary L White, please visit our Tribute Store. "Email Address" would like to share the life celebration of Gary L White. Click on the "link" to go to share a favorite memory or leave a condolence message for the family.